viruses is the most common cause of liver fi brosis and cirrhosis, leading to liver failure and hepatocellular carcinoma. There is no cure for HIV infection, but effective treatment with antiretroviral drugs has dramatically improved the life span and quality of life of infected individuals. A similar trend can already be recognized for HBV and HCV: the development of multiple (directly acting) antiviral drugs and plans to control or even cure the infection. However, approaches that help prevent infection or which provide long-lasting treatment (such as a cure) remain important clinical goals. Gene therapy can theoretically provide a means to obtain durable virus suppression in the absence of medication. 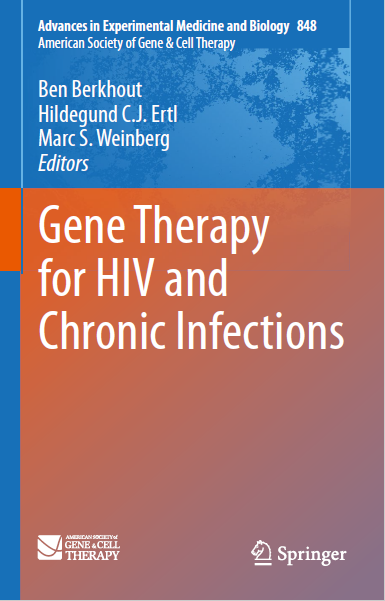 Gene therapy applications for clearance of chronic virus infections have been discussed since the early 1990s. In case of persisting infections with CMV, a herpes virus, vaccination such as with a DNA vaccine has shown to lower viremia, which may be benefi cial to reduce CMV-mediated disease prior to immunosuppression of transplant recipients. Whereas a true cure seems diffi cult to achieve for HIV due to its intrinsic property to deposit its genome into that of the host, such attempts may be within reach for HCV where spontaneous viral clearance occurs in a small percentage of the infected individuals. But even the more diffi cult HIV scenario has recently been spurred by the fi rst (and thus far only) functional cure reported for the “Berlin HIV patient.” In this unique case, a bone marrow transplant was performed because of leukemia and the selection of a CCR5-negative donor, whose cells lack expression of the major coreceptor used by HIV for cell entry, has resulted in the apparent disappearance of the virus from blood. It is clear that such a transplant remains a high-risk procedure, but it provides an important proof of principle that could hopefully be mimicked by gene therapy approaches.